You can do your own investigations of the campaign finances of candidates for public office, political action committees, party committees and ballot committees. Here are some tips. — What Do Common Campaign Finance Terms Mean? — How Do I Find Campaign Finance Records? — What Are Your Tips For Looking Into Mystery Groups? • WHAT IS DARK MONEY? The phrase "dark money" usually refers to money that's used to influence elections but can't be tracked back to the original donor. One common form of this is spending on TV ads or mailers that don't expressly tell people how to vote so they avoid Michigan's state-level campaign finance disclosure requirements. • WHAT IS A PAC? This abbreviation stands for political action committee. Interest groups, companies and individuals use PACs to collect money that they can then spend to support or oppose candidates and causes. At the state level, PACs file reports on their activities with the Michigan Secretary of State. • WHAT IS A SUPER PAC? A super PAC is a specific type of political action committee that can accept unlimited contributions directly from labor unions or corporations but can't coordinate with the campaigns of the candidates it supports. Super PACs' role in Michigan elections has been growing in recent years. • WHAT IS A LEADERSHIP PAC? This is a type of PAC that's connected to an individual politician who uses the PAC to support other candidates and causes. In Michigan, "leadership PAC" is not an official legal term. But often, these types of PACs are used by the politician to advance his or her interests in a race for a leadership position. Leadership PACs have become a popular way to raise money in MIchigan. • WHAT IS A 501(c)(4)? This refers to groups that operate under Section 501(c)(4) of the Internal Revenue Code, which covers social welfare organizations. These types of nonprofit organizations can spend money on politics, often without disclosuring where their money is coming from. One of the most well-known social welfare organizations in Michigan is the NERD Fund, which was a nonprofit connected to former Gov. Rick Snyder's administration. • WHAT IS A 527? This term refers to political committees formed under Section 527 of the Internal Revenue Code. 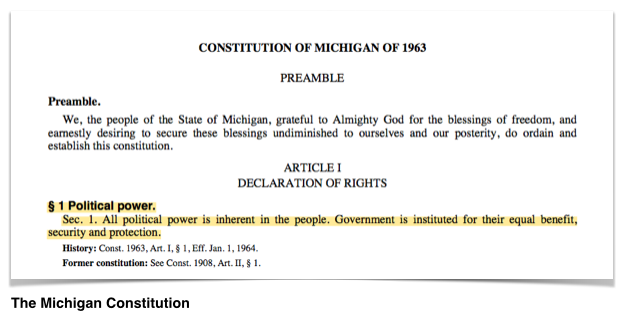 Often, the term is used in Michigan to describe political committees that don't file disclosures with the secretary of state or Federal Election Commission but instead fall under less stringent Internal Revenue Service disclosure requirements. Many state officeholders in Michigan set up "527" accounts to help fund administrative expenses. • WHAT IS CITIZENS UNITED? This usually refers to a 2010 decision by the U.S. Supreme Court that said governments can't limit independent spending by corporations and labor unions to influence elections. Read more about the decision here. How Do I Find Campaign Finance Disclosures? If you want to access disclosures, the first detail you need to know is where to look. If you are looking for a candidate's disclosures, candidates running for state office (governor, Michigan Senate, Michigan House, secretary of state and others) file disclosures with the secretary of state. Candidates running for federal office (president, U.S. Senate and U.S. House) file disclosures with the Federal Election Commission. Candidates running for local office generally file their disclosures with the county clerk. Similarly, groups trying to influence races for federal offices generally file their disclosures with the Federal Election Commission, and groups trying to influence state-level races generally file their disclosures with the secretary of state. 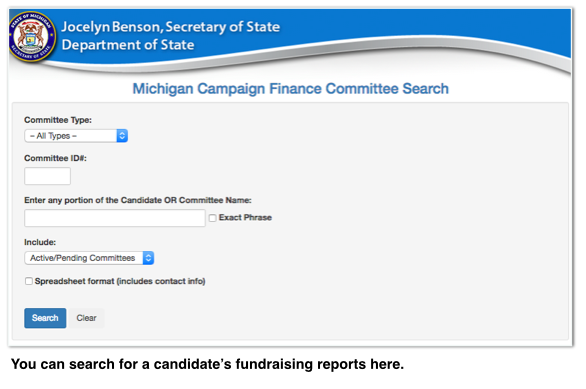 • Go to the Michigan Department of State’s Campaign Finance Reporting Searchable Database. 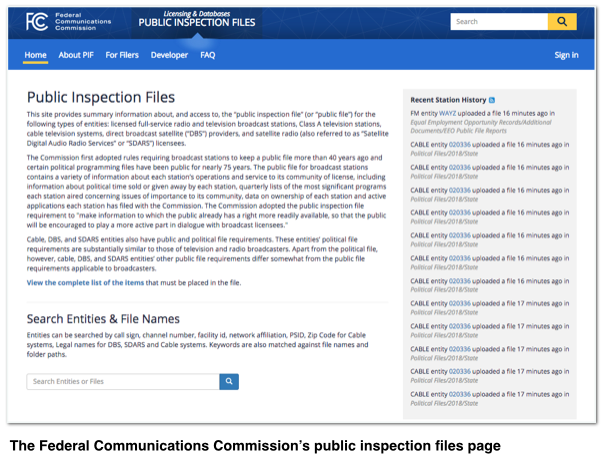 • Under the search options, you’ll find links that will allow you to enter search criteria for the various types of committees that file campaign finance reports with the State. In general, you’ll be able to search by partial committee name and the system will retrieve all committees that match your search criteria. Select the committee of interest to you. • You’ll be taken to a display of the statement of organization with a list of reports that have been filed by that committee, with the most recently filed report at the top of the list. Choose the link for the report you want to review. Keep in mind that reports are frequently amended, so look for the most recently filed version of the report you want. • The next screen will show you the forms in which your chosen report is available. • The various elements of a report are displayed on the next screen. There is a summary page that summarizes receipts and expenditures for the reporting period; an itemized list of contributions, in descending order of size; an itemized list of expenditures, in descending order of size; and a list of debts the committee owes. The exception to this rule is that political party committees are not required to show financial summaries – just lists of contributions and expenditures. • Most people are most interested in who is giving money to candidates, and who PACs support. • There are more powerful search options available to you than the basic search of committee reports. These are the options to search by contribution analysis and search by expenditure Analysis. These options allow you to get narrowly tailored responses to more specific search criteria, and save your data in spreadsheet format so you can sort and filter records in accordance with your needs. Keep in mind, these search functions can pull in extraneous data, so you may need to be a bit more plodding in structuring your search. For example, if you search on a common family name, you may generate results that apply to several candidates; or you could generate records of contributions to more than one candidate committee established by a single person when you only want to see records from one committee. Each committee has a unique six-figure ID number, which you’ll want to locate through the basic search if your advanced search is meant to apply to only one committee. • For example, if you want to know about contributions from members of the DeVos family to Mike Cox, take the link for Search by Contributions Analysis. Enter ‘Cox’ for the Committee Name, or Candidate’s Name; scroll down the search template to the area for Contributor Information and enter ‘DeVos’ in the blank for Last Name/PAC, and hit the ‘Search’ button. Your results are quickly retrieved. • Or, for another example, you may want to know about the history of Blue Cross’s giving to Andy Dillon. In this case, take the link for Search by Expenditure Analysis; enter ‘Blue Cross’ in the Committee Selection; and scroll down to enter ‘Dillon’ under Recipient Information. Press the ‘Search’ button and you’ll get a display of Blue Cross contributions to Dillon’s gubernatorial committee, his House committee and his leadership PAC. • The advanced search possibilities are nearly limitless, and this is the best way to track campaign finance relationships between officeholders and interest groups or campaign patrons. They also allow you export lists in spreadsheet form, which makes large amounts of data easier to handle. In the national context, 527 committees gained a great deal of prominence in 2004 presidential election campaign as purveyors of electioneering communications, or issue advertisements. Perhaps most prominent among them was Swift Boat Veterans for Truth, a committee that set out to attack the presidential qualifications of Sen. John Kerry. In the state context, a number of officeholders have established 527 committees that allow them to raise money from individuals and various types of corporations, and use this money for a variety of quasi-political purposes. These committees report to the Internal Revenue Service. 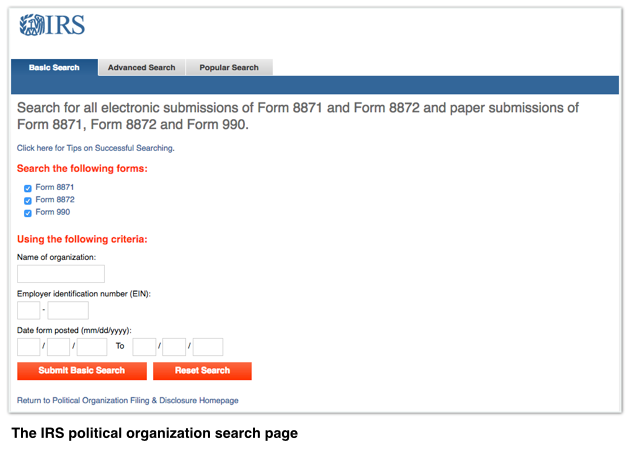 • To search for Michigan-based 527 committees, go to the Internal Revenue Service’s political organizations disclosure search page. • You can then check all three boxes under "forms," and type in the name of the organization you're looking for under "name of organization." • If you don't know the name of the organization you're looking for, you can click on "advanced search" at the top of the page. You can then check the "state" and "date form posted" boxes to narrow your search for organizations that have been active in Michigan over a certain period. • Some 527 organizations file little to no paperwork. Others file disclosures twice a year or on a quarterly basis. If you can find the page of the organization you're looking for, you have to go through individual reports to find disclosure information. Reports for local and county candidates, ballot committees, PACs and party committees that operate exclusively in one county are filed with that county’s clerk. 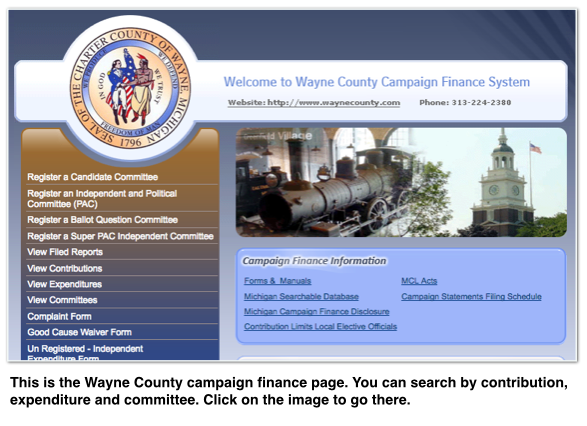 Local and county campaign finance reports for some counties, like Ingham, Macomb, Oakland and Washtenaw, are available online. Macomb County’s records are searchable. The most user-friendly source of federal campaign finance data is the Center for Responsive Politics. 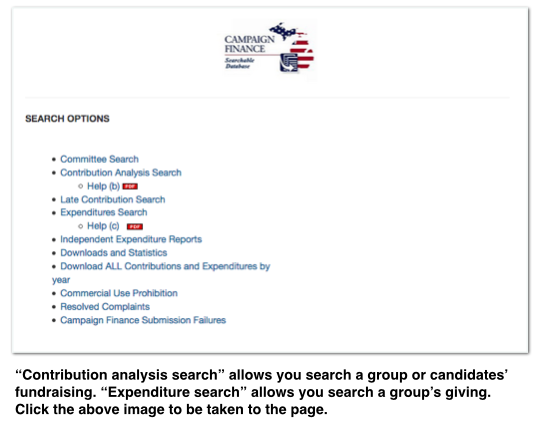 CRP allows easy searching of campaign finance data for officeholders and candidates, PACs, party committees. If you want source data, go to the Federal Election Commission. 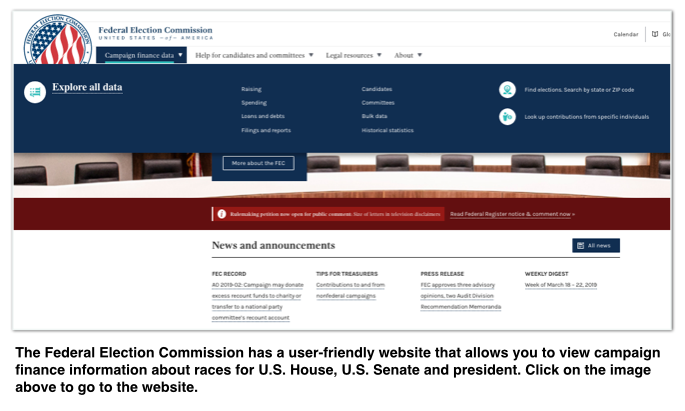 At the FEC site, choose from the menu at the top-left corner of the homepage, "campaign finance data." You can search by contribution, expnditure, candidate and committee. You'll be able to easily view or download reports. Electioneering communications are to federal campaigns what candidate-focused "issue" advertisements are to state campaigns. If you need additional help getting started with your research, contact MCFN at: mcfn@mcfn.org. Current campaign finance laws provide many opportunities for groups to get around donor disclosure requirements if they want to. However, there are still ways to try to figure out who is connected to groups working to conceal their involvement in campaigns. • Many of the groups that get involved in elections but fall outside of disclosure requirements are corporate entities. If they are based in Michigan, they may have filed incorporation documents and other annual reports with the Michigan Department Licensing and Regulatory Affairs. 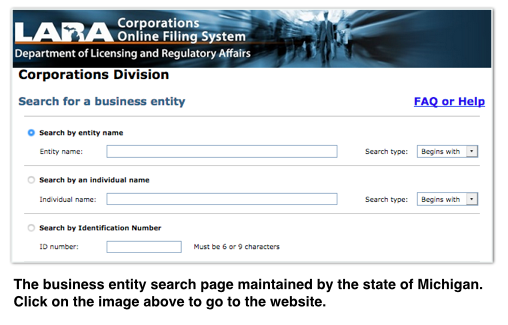 The department maintains a "business entity" search page. If you know the name of the organization, you may be able to find business filings about it. The filings often include the names of board members or at least some information about what type of organization the entity is. Other states have similar search pages. • Many dark money groups are 501(c)(4) social welfare organizations that file annual tax documents with the Internal Revenue Service. These documents can be difficult to find and are often available long after they've been filed. However, the IRS does maintain a search page for information on tax-exempt organizations. It helps to have the organization's employer identification number to do the search successfully. The organization Guidestar also provides much information about larger nonprofit organizations. • If the organization you are looking into is a 501(c)(4) and you have its address, you can ask the organization for its tax filings directly. Most nonprofits make some information available to the public. But keep in mind: the filings that are available to the public provide little information about the organization's financial dealings. • Generally, when TV stations, radio stations or cable providers sell political ad time, they are supposed to make at least some information on the sales available. That's whether the group buying the time is a PAC or something more covert. You can look up a station's political ad sales and buyers through the Federal Communications Commission. Occasionally, the filings provide insight into who's running the groups. You can search by the station's call letters. If you are looking for information on an ad you saw on cable, you can search by your zip code. The Facebook political ad archive is another option to look into a non-disclosing group's digital advertising. If you found this page helpful or would like to see additional information here, let us know.